Lutskaya, Irina K. / Novak, Natalia V. / Kavetsky, Valery P.
The fluorescence properties of dental tissue vary between different age groups of patients, as was discovered by the authors of this article, for example during one of their own studies. This observation must be taken into account above all when creating aesthetic restorations, as there is also wide variation in the fluorescence behaviour of restorative materials. A case study shows that dentists are well advised to pay sufficient attention to this aspect. Now a new generation of materials for chairside treatment using CAD/CAM technology is available. The future of chairside CAD/CAM restoration may be VITA ENAMIC - a composite material that is unique worldwide in combining the benefits of conventional ceramic and composite materials. Both scientific studies and initial clinical experience confirm that with the VITA ENAMIC hybrid ceramic, a new dimension in stability, reliability, precision and cost-efficiency can be achieved. Amalgam is the most extensively used material in dentistry. There have been no clinical trials of this substance and there are no epidemiological studies that allow any conclusions on the safety of amalgam fillings. Amalgam restorations continuously emit mercury vapour, which is absorbed in considerable quantities via the lungs. 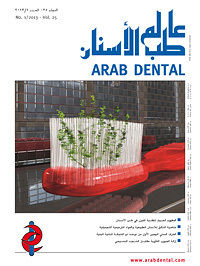 Most scientific reports showed that amalgam fillings are safe and could be used in human to fill cavities, while some other reports and studies concluded that amalgam restorations are harmful for health and suggests that individuals with unusually high emission of mercury from amalgam fillings are at risk. Many dentists remove of amalgam fillings every day, with no regard for the possible mercury exposure that can result from grinding them out. Big caution and preventive procedures must be adopted when removing amalgam fillings to protect both dental operators and patients.